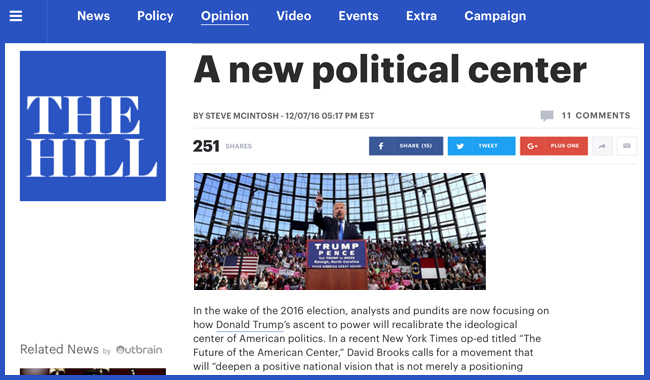 Note: This Op-Ed responds to New York Times columnist David Brooks’ recent writing about the future of political centrism. The piece was originally published by The Hill, a Washington-based political newspaper. It’s reposted here with permission. To advance a form of American politics that can overcome hyper-partisanship and successfully incorporate positive programs from both the left and the right, we must start by building new cultural agreements. And this cultural focus begins upstream from our representatives in Washington. In other words, we need to reestablish a self-identified cultural center in America before we can hope to create a revitalized political center. Therefore, in order to establish greater degrees of cultural unity within our divided American electorate, we should stop thinking of politics merely in terms of a horizontal, linear continuum between left and right. We need to expand our conception of the spectrum of American political opinion by adding a vertical dimension of development to our idea of potential political progress. Such a political move entails rising above the horizontal left-right axis by taking an overview perspective that can see how each side has important values that we need to integrate, as well as shortcomings and downsides that we do well to avoid or otherwise resist. Considering the American political spectrum “from above” helps us dis-identify somewhat from our preferred partisan positions. This cultural overview perspective is predicated on the idea that the left and the right actually need each other—that the opposing sides of our electorate are interdependent, and that some version of left and right will always be a feature of our nation’s political life. Unlike conventional centrist approaches, which often try to simply split the difference between competing interests, an integrative overview approach attempts to synthesize the deeper values that underlie opposing political positions. The issue of gay marriage is a good example of the political progress that can be made through the practice of integrating diverse values. Advocacy for the right to marry has been the key to the larger success of the gay rights movement overall because the cause of gay marriage integrates important values from across the political spectrum. Gay marriage advances both the fairness values of the liberal mainstream, as well as the “liberation values” of the far left. Marriage rights for gays also forwards libertarian freedom values by keeping the government out of private domestic decisions. And crucially, although perhaps ironically, gay marriage advances traditional family values. Social conservatives who otherwise object to “decadent homosexual lifestyles” find it much harder to resist calls for the basic right to make a family commitment. While perceived traditional interests are not included in the new right for gays to marry, traditional values are included nonetheless. As a result of this integration of values, the issue of Gay marriage now enjoys widespread cultural agreement, with approval ratings around 60%. In the same way our culture has become relatively unified around this once divisive issue, common ground (but not necessarily “middle ground”) can be found by working to include values from across the political spectrum within other contested political issues as well. On the issue of immigration, for instance, a unifying cultural agreement could be reached if proposed reforms better integrated the left’s values of fairness and liberation with socially conservative patriotic values (promoting immigrant assimilation) and fiscally conservative meritocratic values (favoring immigrants with talent and resources).